Before starting on my quest for a healthier lifestyle, fibre always made me think of bran cereals and prunes that grandfathers would eat to stay regular. Oi! That cereal was boring and flavaourless and prunes, in my opinion, are yucky. But fibre is very important for good over-all health and it is an important part of a balanced diet. Insoluble fibre helps to keep you regular. Insoluble fibre is found in some vegetables and fruit, whole grains and wheat bran. Soluble fibre helps to lower cholesterol and control blood glucose. Soluble fibre is found in some fruits like apples and oranges, vegetables like carrots, okra and eggplant, oats, barley, psyllium, and legumes like beans and lentils. It is important to eat a variety of fibre-rich foods to get the health benefits of both types of fibre. Lucky for us, General Mills has created a delicious cereal that has 40% of our daily-recommended intake of fibre in only 1 bowl! 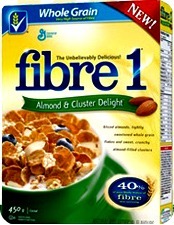 Fibre1 Almond & Cluster Delight Cereal is a mix of flakes, clusters and almonds that is yummy to eat and so good for you! I got to try a box and it hasn’t hit store shelves yet. 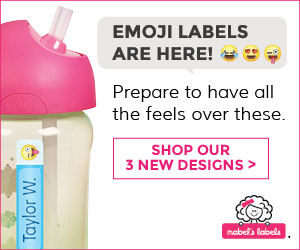 When it does I’m going to get more! You can get a coupon on the Life Made Delicious Facebook page to pick up a couple of coupons. Bring in your July 23rd coupon for Nature Valley, Fibre 1 bars, Golden Grahams OR Cinnamon Toast Crunch treats!